During the 3-4 months that the work in church takes to complete everyone will know that something is happening - there will be a considerable amount of scaffolding for a start. However, exactly what is going on will not be evident so I thought that each month I would write about different aspects of the project. This photo on the right was taken in January after erection of the scaffold. April Update - What have we achieved? As I write this at the end of February much has still to be done. Items that have been made by specialists have only just been delivered to the workshop and the work to put everything back together in the church has not yet started. However, by the time you read this the work should hopefully be near to completion. By the way, when an organist has had no organ to play for well over 3 months his fingers start to get very itchy. So will spending all this money have been worthwhile? Apart from replacing the instrument with digital, which would have been a much smaller outlay but not a good musical or economic option in the longer term, we could have spent less on the pipe organ, doing only the work that was necessary to keep it on the road. This would have proved more much costly over time as more work would have had to be done in a few years, involving major dismantling again along with its associated costs. The instrument had behaved fairly well over the last year or so but when everything was taken apart I found it difficult to see how this was. There were numerous cracks in the wooden soundboards, much of the leather used for the actions in the 1963 build was synthetic and had become totally brittle, some leather used in the pipe work was in a similar state (see photos). Much of the wiring and electrical contacts in the console and in the organ itself was in a really bad way. So the option that we took of doing a comprehensive refurbishment proved to have been a very good decision and we should now have a reliable instrument for many years to come. Many years ago I had a new quite sporty car that certainly moved fast but had problems. I took it to the garage and complained, because whilst I loved the speed I was really keen that it should stop properly, pulling up in a straight line. I was asked if I did much motorway driving. I did - and it seemed that due to the disc brakes being inset they would pick up dust and dirt at speed. I complained about the engine, which was running very unevenly. Did I do much driving in town? Yes. But the engine was designed for the open road, not stopping and starting, they said. It was a no win situation. The St. Giles Organ has been a challenge in that sort of way because the difficulty is that, in a similar way to the design of my car, we need to end up with something that is just as good for accompanying the choirs and smaller congregations as it is for the 12 or more services each year when there is standing room only. We can never expect perfection – after all, there are plenty of large cathedral organs that do not cope at all well with a full building – but with the internal layout changes, additions and use of technology we should be somewhere much closer than before. Whilst I have been writing this, photos have been coming over from the organ builder's workshop, showing the work in progress, see above and right. Due to magazine deadlines etc., the previous pieces were written before the work started and the sight of all the scaffold actually appearing rather than just being written about has bought home the scale of the project. Dismantling took some time and was not easy, culminating, almost 3 weeks into the job, with the big Swell soundboard (ask me all about organ soundboards only if you have an hour to spare) being lowered on a Genie Hoist to ground floor level for removal to the workshop - a very difficult job with all but the organ builders banned from the church for the duration. Now that everything is dismantled it can be seen that not only were the actions very well worn, there are plenty of repairs to be done to both pipe-work and soundboards and the instrument could not have gone on in its present state for much longer. More pipes have gone to the works in Canterbury for cleaning and repair than was originally envisaged because travelling time is saved by doing it this way and so there will often be days when no organ builders appear in the church. Over the last 150 years organ building has benefited from advances in technology and things that mean a lot to organists and organ builders but not to anyone else (except perhaps engineers in organisations such as BT and the London Underground) will be fitted in the workshop. New stop solenoids along with hundreds of Neoprene slider seals will improve the tuning, while the Swell Engine will change from being a huge machine to a small box, specially imported from the USA, that will do a much better job in making the organ's crescendos and diminuendos smoother (I did say it doesn't mean much to anyone but us organ nutters!). The transmission system will have one small data cable between the console and organ, replacing the thousands of little wires that were buried under the floor. During March work starts on re-assembly. Large items that have been taken to the workshop for refurbishment, including the console and soundboards, have to be returned to the church and put back where they belong, which, of course, involves bringing in the Genie Hoist again. Then all has to be connected up. As almost everything behind the facade will have been turned through 45° many alterations have had to be made. All the wiring and transmission system are new and, while it is all low voltage, the number of connections that have to be made are almost too many to count. After this, a very important part of the work starts to happen. The pipes (over a thousand of them) have to be reinstated in their new positions. All have been cleaned and regulated, some will have been repaired, others have been changed so that they sound different and a few are new. The person who 'voices' the pipes has to work his magic to make everything sound right. I cannot begin to understand how they do this: if you stand close to organ pipes they shriek at you and some are almost deafening. The voicer has to work in this racket but end up with a sound that sounds good at the other end of the church. Every pipe has to be 'fine tuned'. As it can occasionally take over half an hour to fine tune a couple of pipes, depending on their size and pitch, this is a painstaking job and done in extremely cramped conditions. This 'last half mile' of the project is so different from the first half mile as those people who, a couple of months ago, were working wearing hard hats and safety boots for what appeared to be a demolition exercise are now spending hours and hours making intricate adjustments to get things just right. In April the work should be nearing completion and we shall be looking forward to the re-dedication of the organ on 19th May, which we also want to be a celebration of the musical life of St. Giles – because that is what the project is really all about. Every time that work has been done to the organ since the second half of the 19th Century I can see that those involved have done the very best they can in a building where it could not be much more difficult. John Wade, who some will remember from the days when he was assistant organist in the 1960s, has very kindly sent me some very valuable information on the work that was done in those times – more of that next month along with details of the opening recital which will be by Daniel Moult and will take place after the final voicing review and re-tuning on October 12th. Progress on work to the organ is now well under way. Last month we looked at the work that is being done to the console. This month it's more about things that no one can see at all, a few things about the inner workings. This is where Swanley comes in. Organ building became really big business in Victorian times but by the 1930s the pace had slowed as most churches had a well constructed instrument. A couple of builders did well building cinema organs but others spent more time refurbishing and 'modernising' existing instruments. Innovation was the order of the day. Henry Willis III, principal of one of the most highly regarded organ builders, was constantly on the lookout for ways to get ahead of the competition, even travelling to the USA and making reciprocal arrangements with an organ builder there but his most far reaching move came one afternoon in Peckham, just down the road from his works, when he burst in to the premises of Kimber-Allen Ltd., a very small engineering company, holding several components that he normally made in house, asking if they could do it cheaper. They could, much cheaper. Orders were placed and Kimber Allen grew so quickly that they went over to just making organ components and moved to much larger premises...........in Swanley. Other specialist suppliers have emerged through the years and, in common with most manufacturers, organ builders now tend to make few parts in house. Today, almost 90 years on, there are some components for organs that Kimber-Allen supply to the trade exclusively. 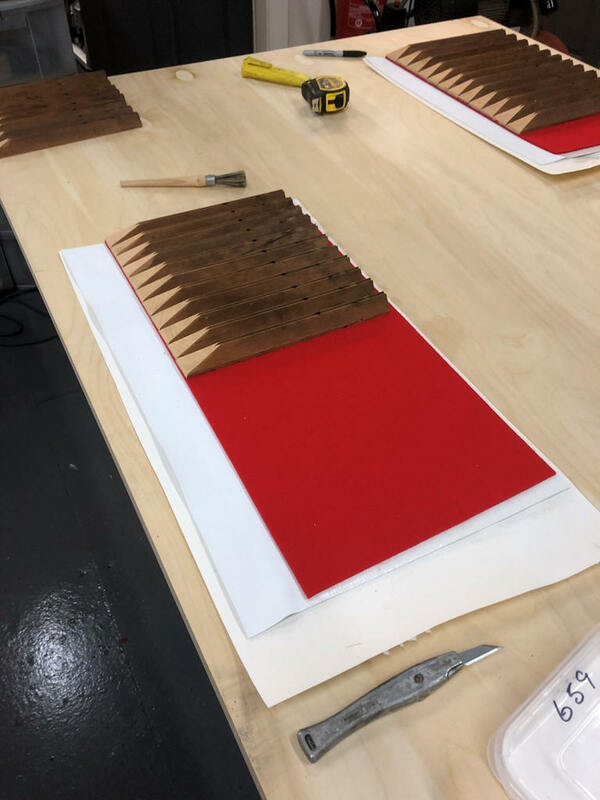 Our re-built organ will have fewer of their components than it did previously as we have meticulously specified the manufacturers of all the components that the organ builder will buy in. These will come from two companies in Brandon, Suffolk, one in Lancashire and also from the USA. 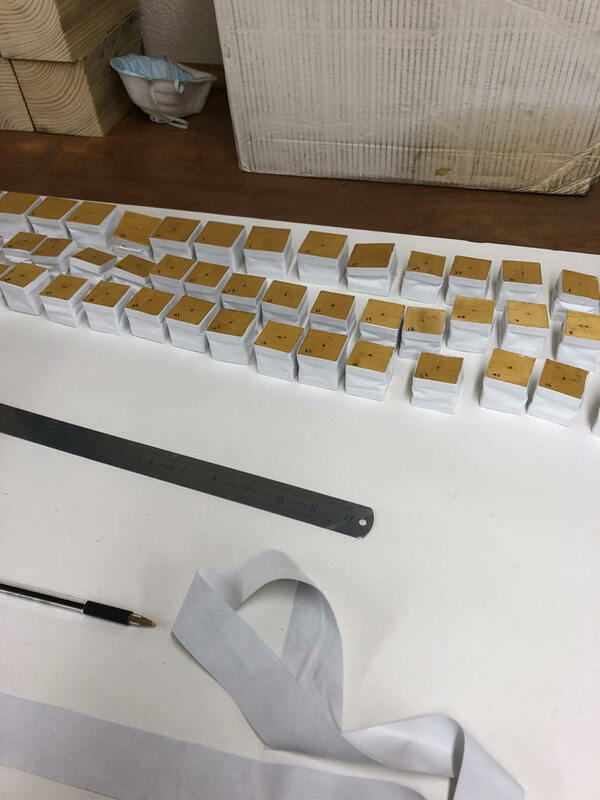 Components from these suppliers will be found on many famous instruments such as those at King's College Cambridge and St. Paul's Cathedral. However, those UK manufacturers will themselves buy some parts from Swanley. FH Browne and son, our organ builders, do more work in house than some. In January they started refurbishing the soundboards – these are what the pipes stand upon, some of them are over 120 years old and this is probably their first refurbishment. 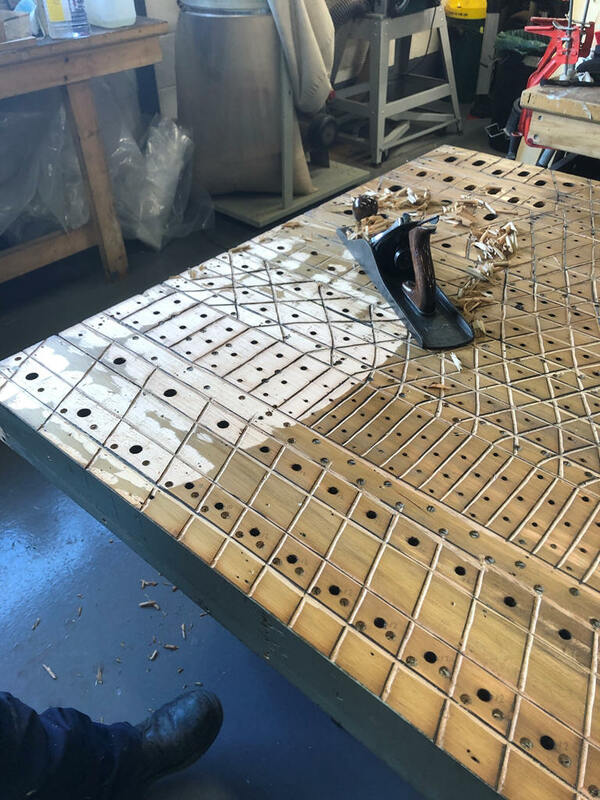 During February they will have taken delivery of the components they are buying in and will be busy in their works fitting them to the refurbished soundboards and console. Some of the pipes will have been taken to the works for repair and up-grading but many will remain in the church where they will be cleaned – organ pipes are easily damaged and it makes sense not to remove them from the church if work to them can easily be done on site. I hope to be able to get down to the workshops in Canterbury to see some of the work in progress, partly because I would like to know that everything is going as we want but also because I love seeing craftsmen at work. Much of it would seem a bit strange and dull to many people and include very large hunks of wood being flooded with hot glue, hundreds of Neoprene seals that look like big Polo Mints being stuck to smaller bits of wood, large solenoids (fresh from Swanley) being fixed to yet more pieces of wood. All these things should not only make the instrument reliable for many years to come but will improve tuning. Coming up next month: details of what is being done to improve the instrument's sound and make it more suitable for our needs. And no mention of Swanley, I promise! That's the bit where almost everyone can see the organist playing but he can't see anything much himself. I never could understand why that is. The console was made in 1963 when the organ was moved to the West gallery. In those days people were still fascinated by a musical instrument that could be played by remote control so everyone would have been very excited about it being as far from the organ itself as possible. It was made in the workshop of the organ builder, Kingsgate Davidson Ltd., In South London. Some of the dimensions are not standard, making it not very pleasant to play. If anyone had asked organ builder Mr. Davidson why that was, according to organ builders' legend he would have stroked his chin and said 'I shall consult with Mr. Kingsgate on the matter'. This would not have been a good answer, firstly because Mr. Kingsgate did not actually exist and never had and, secondly, the standard for console dimensions was not formalised until 1967 so he had a readymade excuse anyway. After 55 years it is not surprising that almost everything in the console is worn out. It will be removed to the organ builder's works (quite possibly via Swanley) for complete refurbishment. The two keyboards will be replaced with top quality new ones. For some reason the old keyboards have five more keys than they need at the top which do nothing (Mr. Kingsgate could have been asked about that one too) and reducing the compass of the keyboards to the standard 56 notes will be a great help in correcting the console dimensions. The pedal board will be completely refurbished and will look like new. Inside, the wiring and switchgear, much of which looks a bit like a telephone exchange from the 1950s, will be stripped out and replaced with a digital transmission system, but more of that in the months to come. Organs come in all shapes and sizes and the keyboards can number anything from one to seven. The St. Giles organ has two keyboards - referred to by organists as ‘manuals’ - which is the number one would expect in a relatively small building. This is quite sufficient for what the instrument is used for much of the time but the Choir also sings music where the accompaniment would have been written with a three or four manual organ in mind: playing it effectively on a two manual is not easy. Technology has come a long way since 1963 and it is now possible to include what are termed 'registration aids’ which could never have been countenanced then. These will make the instrument easier to play where a larger instrument is really called for. The same technology makes it much easier to do some other things that would have been difficult in 1963: more stop keys will appear, making the instrument appear larger than it was, although overall it will increase in size by just a few additional pipes. Finally, the design of the music desk makes it almost impossible to see a conductor (to be fair, there was no reason to make Mr. Davidson tell Mr. Kingsgate off about this one as the console originally faced in another direction) so this will be altered and adequate console lighting provided. The console is just one part of the works – and we don't yet know why organ builders have such a thing about Swanley. We shall have to wait until next month for that. The photos below, also the ones below left, were taken mid February 2019.